As a mom of 3 children, so happens to be all girls. I have noticed in this society girls have been treated differently as guys. Meaning girls can’t do what guys can. So, when I had the chance to read this book I wanted a little more intake of the subject at hand. 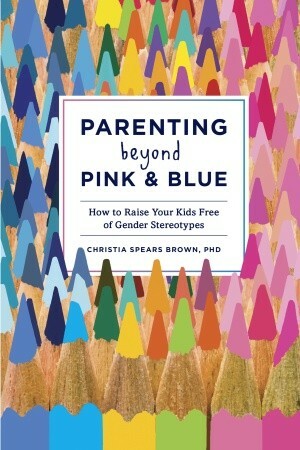 I noticed there was a lot of truth to be told in this parenting book, this book is made for parents who have both genders in my opinion. I asked my mother in law about some of it, because she has 4 sons and no daughters. But, all her Grandchildren are girls. I was raised in a family where females dominated the males. My mother had 2 girls and my Aunt had all girls and her last child was a male. I see on TV a lot that they play the stereotype card a lot. They are always talking about men beating on their girlfriends and wives. Or, just females get raped. That is stereo typing. Just because yo don’t hear it from a male that its happening , does not mean it, it’s not happening. Another example of parenting blue and pink is , They like to constantly blame African American men and boys for their behavior. The way they dress people automatically think that they are bad news or gang related. This book explains how to treat each male/ female the same and not to judge a book by a cover. All it takes is to get to know someone or research the persons body language it can tell you a lot about a person. I came from a strict family where whites belong with whites and men belong with females. As, a bisexual female I am not ashamed who I am , my family had difficulty with accepting it and I point blankly said if you can’t accept me for who I am then what kind of family I am living. When reading this it gave a lot of point of views and advice. My children look at people and stare at them who have disabilities, I do ground them sometimes as it keeps happening to the point now, I sit them down and ask them if you were in their position how would you feel if someone continued to stare and talking about you behind your back. Another thing is we have a new baby and she is turning 4 months. My daughter is 7 and my step daughter is 8. I told them I understand they were raised in different environments. My daughter has been raised by her step father since she was 2 and my step daughter never really had a co parenting with her biological father. We tell them this is the time to set a example for their baby sister. A real big stereotype I been seeing is that parents who ground one child end up grounding the other because they feel its not fair. I do not agree with this. As, my children if one does something wrong and the other has been not part of it and has been good why punish a child who isnt doing anything wrong. Another, thing when they tell us it’s not fair we tell them , life is never supposed to be fair. We have to earn and be greatful for what we have. Thats why I recommend this book to family and friends and to my blog followers. This is a terrific book with lots of advuce to handle different situations.